Connecticut/Rhode Island Atlas & Gazetteer, by Delorme Map Co., 2007. DeLorme’s state atlases are renowned for their detail and abundance of information. Each includes detailed sectional topographic road maps for the entire state, in handy atlas form. Even the most obscure dirt roads are shown. The maps reveal many geographic features and landmarks as well. The Gazetteer section offers detailed listings for attractions, campgrounds, fishing, skiing, paddling, golf, hiking, museums, parks, scenic roads and unique natural features. 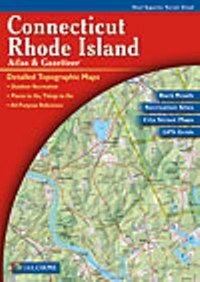 The Connecticut/Rhode Island Atlas & Gazetteer has 60 pages of maps, including street maps of Bridgeport, hartford, New Haven and Providence. The main sectional maps are at 1:65,000 scale with 100-ft. contours. 80 pp, 11” x 15 ½”.